Before you start scratching your head about this post, a quick clarification – it is a giveaway hosted by Sandy and Donna from Everyday Southwest (everyday food with Southwest flair) in conjunction with their blog’s first year anniversary. 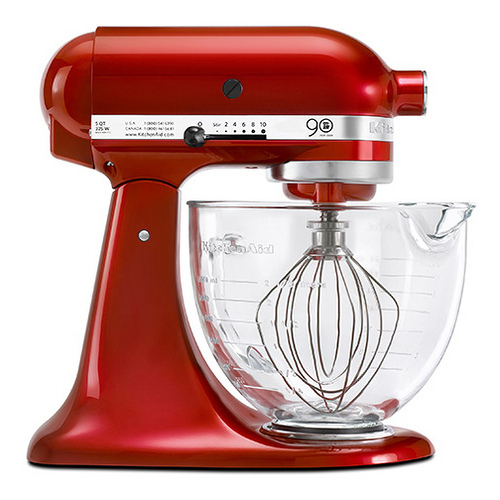 And one winner is going to receive a red chilli pepper (so they called it) KitchenAid mixer. I’m not sure whether it is open to US residents only or not, but I’m just going to enter it anyway. So yeah, I’ve a vested interest in doing the post. Also, I wanted to share the news to those who are not aware (honest!). Good luck to anyone who intends to enter! Originally I had this easy dessert (a practice exercise for an upcoming dinner party) in mind for today’s post. Unfortunately, I was down with a flu and lost motivation to do anything today (except for surfing the net and writing this post, obviously). If you haven’t noticed, I’m trying to blog as often as I can – daily from Mon to Fri, if possible, especially I’m in between jobs at the moment……Alright, alright, before this post got any longer than it should be, I better stop rambling…. I suppose not even flu can stop me from talking (much to my beloved’s disappointment, kekeke!). So take care and drink plenty of water, my friends! Hi! Thanks for helping us spread the word about our birthday! Yes, everyone is welcome to enter. If someone outside the U.S. wins, I’ll find a way to get this beautiful prize to them. A foodie friend from Thailand entered. Hmmm… I wonder if elephants would be involved?